My second interview at DragonCon 2015 was with Lily and Matthew. When I first approached them for a picture, they were perfectly in sync together as Chihiro and No-Face from the anime movie Spirited Away by Studio Ghibli. Chihiro was a bit silly as she spoke to me, and No-Face was very solemn as he just simply stood there and waved. When I then began to interview them, they both quickly opened up and were willing to discuss their Spirited Away cosplay and how it is to work together on making new cosplay. This interview is lightly edited for clarity, and some of my questions are edited for concision. My questions are in bold. 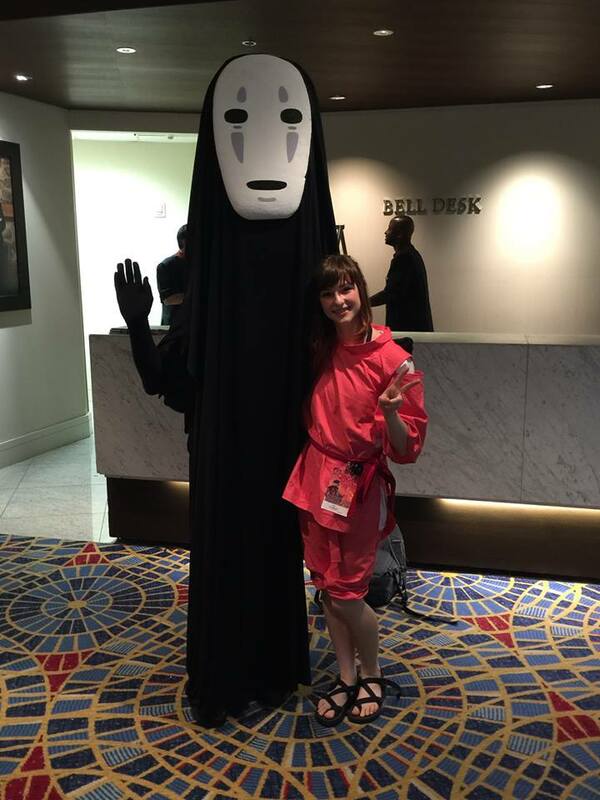 Chihiro and No-Face posing together in cosplay from the anime movie Spirited Away during DragonCon 2015. Good morning, who are you cosplaying as? Lily: My name is Lily, but I am cosplaying as Chihiro from Spirited Away. Matthew: I am Matthew and I am No-Face from Spirited Away. Why did you choose this cosplay? Lily: This is my favorite Studio Ghibli film and I looked at the costume design and I figured it would be kinda easy to make for my time constraints, and we figured it would be fun since we both love it so much. Matthew: I’m not sure. I love Ghibli films and – everyone say can that, I think- to be able to step into the character and actually get the attention. It allows normal people to feel like celebrities for a day. So its really fun. You made the costumes yourselves? Lily: Ummm. *laughs* Sewing the pattern for my bathrobes wasn’t TOO difficult ’cause it was pretty simple working with easy fabric, but building the cage for No-Face, because its actually a helmet sitting on top of his head, was a big hassle. *laughs* It took a long time and we stabbed ourselves and we had to use like a stable gun from the 70’s. Lily: It was fun, it was worth it. Yeah. 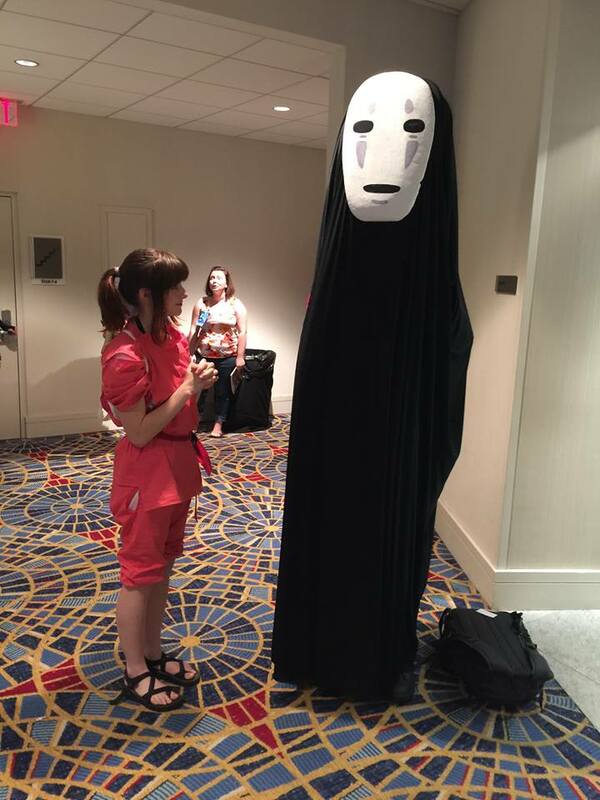 Chihiro and No-Face interacting together in cosplay from the anime movie “Spirited Away”. Was this your first time cosplaying? Matthew: We wanted to do something more mainstream. -I like seeing people’s reactions. Getting into the character, you know, being in character. Getting pictures with people. Like, I’ve seen a lot of kids who are really excited to see us. And that just makes me happy. -Its a lot similar for me. Its just, people walk up to you and its the surprise on their face when they see what it is and they make the connection – its great. What other conventions do you two go to? Lily: Yeah, and Momocon down in Atlanta. No-Face has gold for Chihiro. 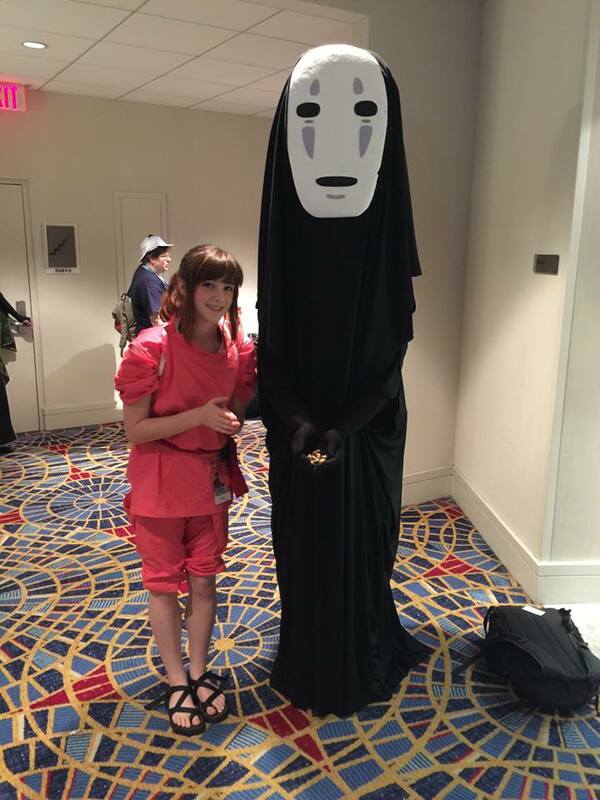 Both of them are in cosplay from the anime movie Spirited Away at DragonCon 2015. What is your favorite part about cosplaying? Why do you do it? Lily: I like seeing people’s reactions. Getting into the character, you know, being in character. Getting pictures with people. Like, I’ve seen a lot of kids who are really excited to see us. And that just makes me happy. Matthew: Its a lot similar for me. Its just, people walk up to you and its the surprise on their face when they see what it is and they make the connection – it’s great. I definitely had that reaction as well, if you could tell. What other cosplay are you planning on doing in the future? It reminds you of why you do it. It can get stressful but when you’re having fun with other people, that’s what matters. Matthew: But its worth a shot as one of those long term projects. And I think Hellboy is on my list. 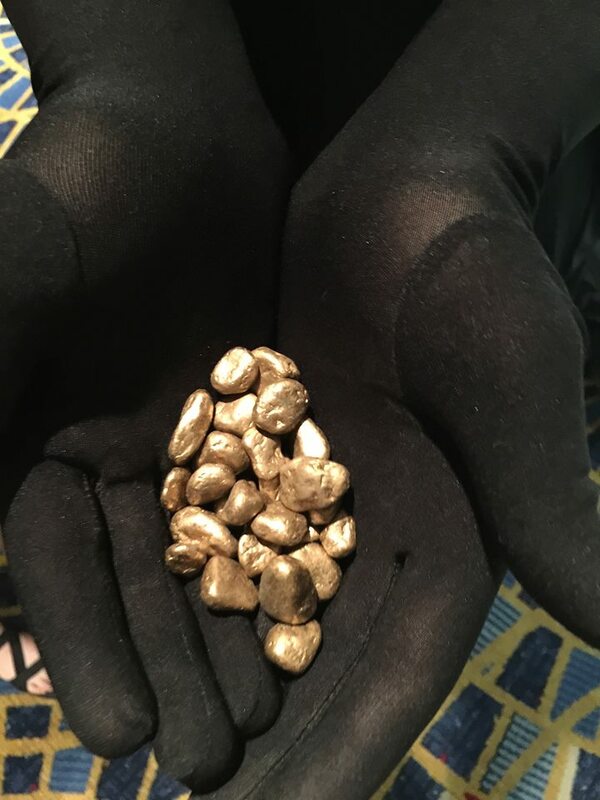 No-Face’s gold in a close up. This is cosplay from the anime movie Spirited Away at DragonCon 2015. Now to wrap it up, is there anything else you want to say about cosplay? Lily: I think its really fun doing a group cosplay. If you can find friends who are interested in the same thing and you can work together on it, I think that’s what makes it the most fun. ‘Cause we’ve put in a lot of long nights just hanging out in my basement working on stuff. Matthew: It can be really stressful by yourself without having anyone to vent with. Matthew: Working together feels really great. Lily: It reminds you of why you do it. It can get stressful but when you’re having fun with other people, that’s what matters. Matthew: You just laugh it off. 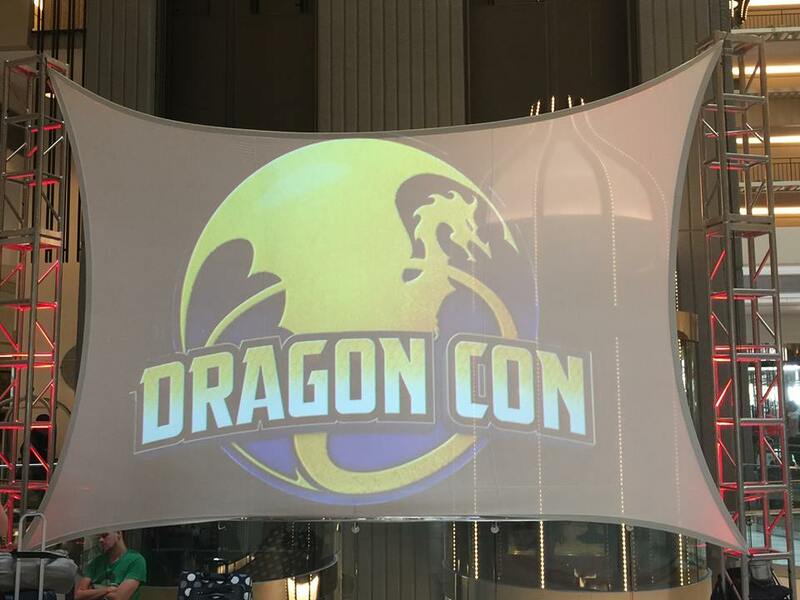 This is Part Two of a five-part series about cosplay at DragonCon 2015. Part Three will post tomorrow (September 16th, 2015) at 2 P.M. Pacific Time. Previous Post:Super Mario Maker Stage Headed to Smash Bros.